Continuing a long history of assisting and facilitating the development of legal education in Ethiopia, Thomas Geraghty (JD ’69), director of Northwestern Pritzker School of Law’s Bluhm Legal Clinic, organized a three-day conference and training workshop on clinical legal education at Addis Ababa University over the winter break. Geraghty was joined by Meredith Martin Rountree, a visiting assistant professor of law, and Rob Owen, clinical professor of law. The program opened with a day of presentations and discussions, followed by two days of training designed to familiarize Ethiopian law faculty with methods and models of clinical education used in the United States. Kimberly-Claire Seymour (JD ’16) attended the conference and workshop, and spoke about the value of experiential learning from a student’s perspective. She was struck by how committed Ethiopian faculty members were to providing the best possible opportunities for their students, despite significant resource constraints. Those significant challenges meant the Northwestern Law faculty couldn’t just impart best practices, but had to help develop solutions specific to the realities of Ethiopia’s legal education, Rountree said. Geraghty first visited Ethiopia as a Northwestern Law student in the 1960s. He reconnected with colleagues at Addis Ababa University after the communist regime was overthrown in the 1990s to help build the country’s legal education infrastructure. 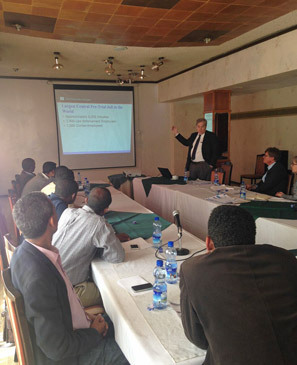 Understanding how important practical training through clinical work is to a quality legal education, Geraghty is committed to a series of exchanges between Northwestern Law clinical faculty and their Ethiopian counterparts. He added that it’s not just the Ethiopian faculty who benefit from the exchange.